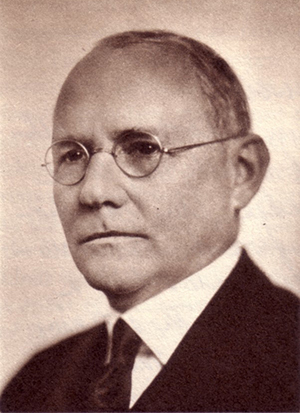 John C. Futrall was the longest-serving president in the history of the University of Arkansas, initially hired as an acting president while the university’s Board of Trustees continued a search for a replacement to President Tillman. Futrall received his public education at Marianna, Ark., where his father was superintendent of schools. At the age of 15, he came to Arkansas Industrial University in 1888 to study Classical languages. After two years as a student, he left Arkansas under some cloud of disciplinary action, apparently playing cards for money, and finished his bachelor’s and master’s degrees in Classics at Virginia. He returned to Arkansas in 1894 as the chair of the mathematics department. While teaching, he also recruited and coached the university’s first football team. He did further graduate work in the Classics at Johns Hopkins University, the University of Chicago, and the universities of Bonn and Halle in Germany. When acting President John Hugh Reynolds resigned, the Board of Trustees appointed Futrall to serve as acting president. After a year, the board elected Futrall to the position permanently. Over the next 25 years, Futrall survived attempts by students and legislators to have him replaced, efforts by the Farming Bureau to remove the College of Agriculture, and reductions in university’s finances wrought early by World War I and later by the Depression. Through it all, the university continued to grow under Futrall’s tenure. The College of Business and the School of Law were created. The North Central Association granted the university accreditation. Enrollment nearly quadrupled. Many of the major buildings on campus were erected during Futrall’s tenure, including Vol Walker Hall, the Agricultural Building, the Engineering Hall, the Chemistry Building, the Women’s Gymnasium, a new residence hall, Razorback stadium, and the Chi Omega Greek Theatre. Construction of the university’s first student union was well under way when Futrall was killed in a traffic accident while he was returning from business in Little Rock. When it opened, the students voted in favor of naming it Futrall Memorial Hall in his honor. Personal: Futrall was born in 1873 near Jackson, Tenn., to Thomas A. and Emma Headen Futrall. In June 1898, he married Annie Gaines Duke, and they had three children. He died Sept. 12, 1939, in a traffic accident near West Fork, Ark.